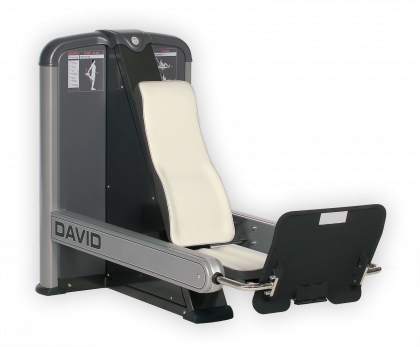 All of the machines have the white upholstery, grey trim and silver frame color. 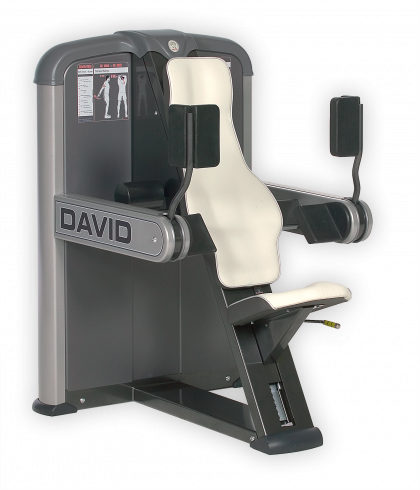 They are in excellent condition as they were bought new and only used within my facility for SuperSlow, these machines are very rare here in the USA, but are sold all over Europe and were used at the training center for the Beijing Olympics games. All of the machines have upgraded heavy weight stacks. 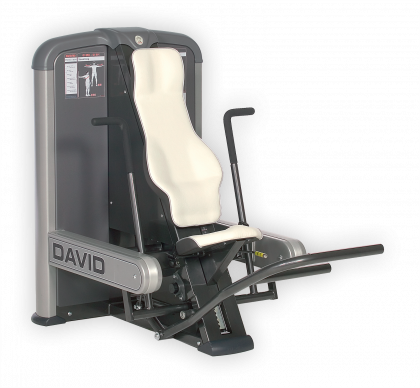 The Abdominal is a medical machine, one which DAVID swears by in their back rehab programs. 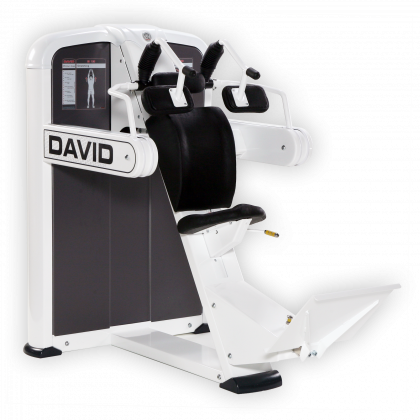 David used fused movement arms and cam fall off after maximum moment which makes these machine very compatible with SuperSlow protocol. Why are you selling your “Dumpers”? I recommend a re-read of the Dumpers articles…they are fairly technical so it may take a few runs at it. best of luck! BTW to those inquiring these are all sold…the MedX Pullover is still up for grabs because the guy who asked me to hold it for him reneged. i see that you have a real yearning to participate? i’ve really put this site on hold in favor of RenEx Inner Circle, can i recommend that page for you? LOL, real technical. We lift slow so we have time to think between reps, LOL. I cannot afford Inner Circle so I will come on here everyday and insult you for free. OK, Joe H…I understand, I’m curious, what do you do for a living and how old are you? How to you perceive yourself and how do you perceive the gains you’ve received from strength exercise?. I think there is a interesting story here…there has to be with your extreme dedication to trolling. I know you enjoy contributing so i’m happy to give you a voice so you can tell us all what you think is best and what RenEx should be doing. Please end the childish behavior as it reflects poorly on the supposedly educated staff of RenEx. Josh you and your RenEx team are monkeys. I have no interest in a discussion with you. You can continue to BS, theorize, and use a failed protocol. Meanwhile I will make sport the people using your protocol. “I have no interest in discussion with you” Joe H-yet you come here and check in multiple times daily and for all practical purposes the site lays dormant in favor of RenEx Inner Circle. “You can continue to bs, theorize” Joe H. please share what’s comments disturb you ? “You can continue to use a failed protocol” Joe H.what protocol do you recommend, what method is a success? what experience do you have training in a facility with ideal instruction/feedback, environment and equipment? Personally i could not be happier with my results or the results of my clients, just curious how would you rate your muscular development, care to post a pic with your ideal training program? are you younger or older than me? it’s really cool with this method you only get better with age :-)….i’d like to see what program that you recommend that holds up in this regard. again thanks for your continued interest/obsession. Joe H, may i recommend an article by Ken Hutchins named “Exercise vs Recreation” ? you may just insert the word ‘mental’ before the words exercise or sport/recreation. You’re wasting your time I’ve seen your results and I’m not impressed. well of course you are not, i said i was, but i’ll play along…i’ll post before and afters spanning a 23 year period and i challenge you to find anyone who has made more consistent gains….especially if you can find someone who spent less time…..better yet i’ll post my progress of me and that of 10 other people if you will post yours. You’re too funny Joshy. So easy to trip your trigger. Your scrawny kid mentality and the chip on your shoulder isn’t becoming in a man of your age. Stop fishing for pats on the back and kudos for what you’ve accomplished, many people have done the same or better with less. Stick to the fitness comps and leave the bodybuilding for others. This is about your (or should I say the Hutchins appropriated theory) on training and your (his) inability to provide facts. Keep talking all the while providing nothing but half baked text book passages and flawed assumptions. I see your articles are still all about “feel” and guessing during training. Science at its best, LOL. Joe H. has issues with anyone not holding to his methods. If the protocol I use is different then his than his, the it is proof to him that I must not “Know ” anything. some money. We could take up a collection.